April 8th is Draw A Bird Day. In 1943, 7 year old Dorie Cooper visited her uncle, who had been wounded in the war, in a veteran’s ward of a hospital in England. Hoping to cheer him up, she asked him to draw a bird. On her following visits, other wounded soldiers also joined in drawing birds and in a few months, the ward’s walls were fully decorated with bird drawings. Dorie died when she was only 10 years old, and afterwards those who knew her celebrated her birthday, April 8th, by drawing birds. Now, people all over the world draw birds to express joy on this day. You can find more info on the the official dabday site. I learned about this day from Laura at Create Art Everyday and she learned about it from M.R. Emberson at A-wing and A-way. Laura inspired me and a few other WordPress bird-lovers and artists to draw birds on April 8th last year. And then she inspired us to draw birds on the 8th of every month too. M.R. Emberson writes about the many connections between birds and human society and his wife, J.M. Landin, illustrates each essay with beautiful pen, ink and watercolour birds (she also has her own art and science blog at RedNewtGallery). Kerfe and Nina now host the monthly Draw A Bird Day and you can check out last month’s round up on their blog Method Two Madness. Charlie at Doodlewash is celebrating “official days” with pen, ink and watercolour paintings throughout the month of April and has invited people to join him. 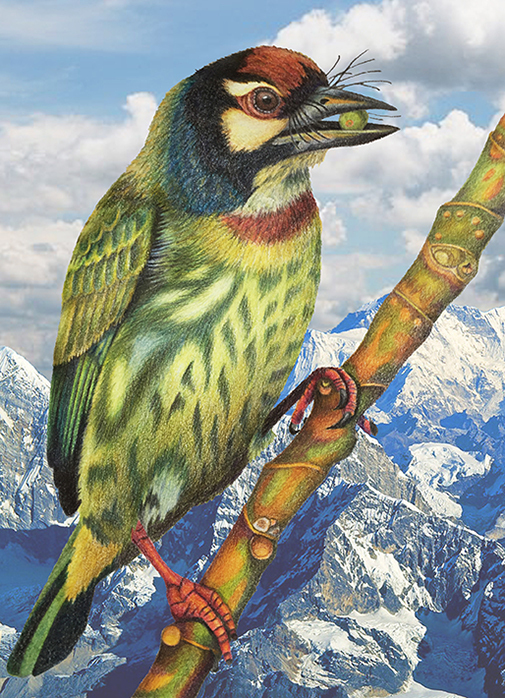 My April bird is a Coppersmith Barbet from a photograph in Audubon’s book “Bird – The Definitive Visual Guide”. It is my first drawing with my new set of 60 Polychromos colour pencils. 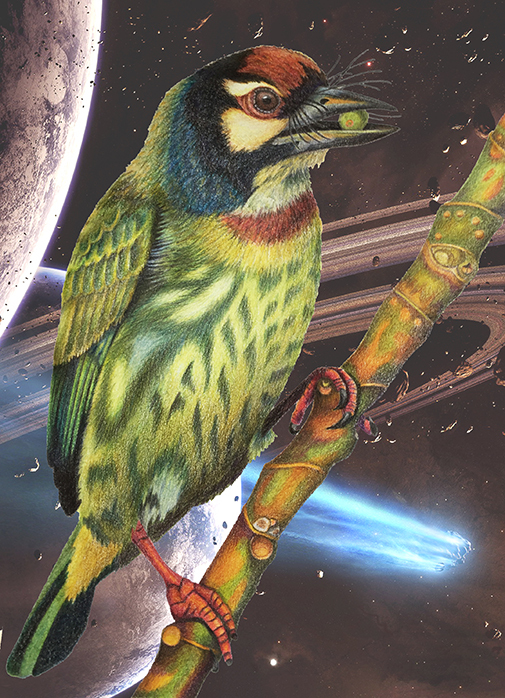 I picked the Coppersmith Barbet because of his multi-coloured feathers. The colouring took many hours, which I spread out over a few months, a couple of hours here and there. When I moved homes in late February, I put the drawing aside for a few weeks. To find the colour pencils I had been working with, I examined the pencils in the box to find those that were a bit shorter than the others. Since then, when I work on multi-day colour pencil drawings, I keep the pencils I’m using separate and bound with a rubber band. The “paper-version” of my drawing has a white background. 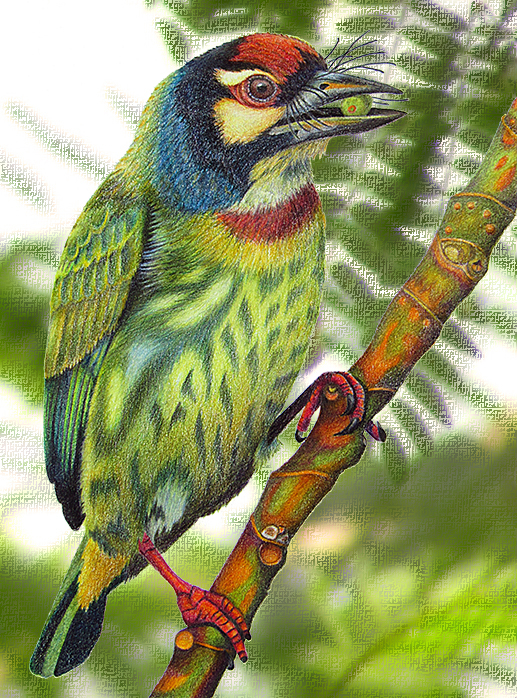 The background foliage in the digital version was created with Photoshop – cropped from a photo, blurred and given a rough pastel filter. My husband J was the initial motivator behind the jazzy background. He loved the drawing but thought the white background was missing a little “je ne sais quoi”. So he added different backgrounds in Photoshop – plain light-grey, a jungle and some mountains. I was thrilled with the jungle and mountains and asked if he could think of a third fun background. I thought light-grey was a bit too drab for a plain background so I tried some slightly noisy light-grey-blue. How funnnn and bright and cheery!! I am amazed at the detail and time you put into this myr!!! I cannot lift my jaw up off the floor. At first I thought it was a photo you altered. You drew this! I have no words for my shock and awe and admiration! Wowzie!!!! Thanks so much for your Wowzie Jodi! It always gives me a big smile :-). I’m glad my many little colour pencil strokes worked out. Myriam, this is so amazing that I initially thought it was a photograph. The amount of detail is just incredible. I really enjoy the jazzed up backgrounds that your husband came up with. The one in outer space is my favorite! Thanks for including the history behind Draw A Bird Day, as well as the links to all the sites. Laura, Kerfe & Nina, you, and all the other artists have done amazing jobs turning the holiday into a monthly phenomenon! Have a great weekend! Thanks for your awesome compliment M.R.! It was an interesting exercise – taking time to lay on all those little strokes of colour. It seems I do have the patience to do that! Glad you enjoyed the backgrounds. My husband likes to be creative with Photoshop and I’ve been having fun learning from him. 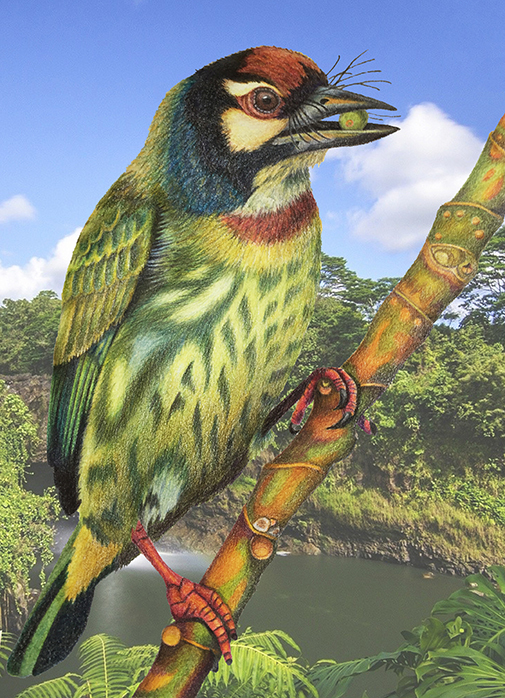 Sharon Mann, a draw-a-birder, creates very cool Photoshop collages from her scanned drawings and patterned cloth. It is pretty cool that DABD turned into a little community of artists thanks to you, Laura, Nina, Kerfe and all the artists who participate :-). Not only do you have amazing patience and talent, you and your husband are quite the team! I’ll have to check out Sharon’s work. You, Laura, Nina, Kerfe, and many others are really talented artists. I’m happy to just be a part of it. Oh my gish thus is beautiful!! I too thought it was a photograh st first. I hope you’re planning to frame it and hang it on your wall. The details and colors are exquisite! … I’m wearing the wrong glasses and on my cell phone. Sorry for typos! Later that day I was able to view on my computer screen OMG! It’s stunning! You should frame it and hang it on your wall. It’s so beautiful. The details are amazing. You’ve got a gift! :-)!!! Thanks Deborah! You’re motivating me to try another detailed drawing. Maybe in watercolour? I recently watched a few videos at Anna Mason Art. Her flowers are very detailed and realistic. So many layers and tiny brushstrokes though! Yes, yes, yes! More drawing and watercolor! I have watched Anna Mason too she’s amazing. You might prefer Billy Showell. Lots of detail, but it seems easier to attain if you practice. I am enjoying her book, but making slow progress with the exercises. I’ve been working on the first one. It has helped me to lay the paint down more evenly, and has taught me how to blend the layers of paint. So, for that it’s been great for me. Oo, I like the easier part! I will try to get one of her books this week. Thanks for sharing your experience and recommendations. I’m hoping a little painted hummingbird will be my May bird. I hadn’t read the story of how Draw a Bird Day came about at Laura’s so I’m glad you told the story here. 😊 This is absolutely stunning! I love all the details and colors! I last did something like this about 15 years ago and have gotten away from colored pencils since because it’s so time consuming. The different backgrounds are a hoot! Thanks for your super wonderful compliments Teresa :-). I read about the official DABD last year but forgot the story so I thought writing it down would help me remember. Glad a few others also found the information interesting. I ended up drawing a few quicker birds while working on the barbet. Colour pencils make the pinky-side of my elbows really achy after a while. Motivation to learn to paint! Thank you for sharing the story of draw a bird day. Your bird is amazing! Thanks for the lovely compliment Susan :-)! And glad you appreciated my retelling of the story. I read it last year too, but forgot it. Fantastic drawing, Myriam, and fun backgrounds too. I had heard of Draw a Bird Day from other blog posts, but never knew the background. Great post! Thank you so much for your kind words Jet :-). It has been a year since I thought about the origins of the official Draw a Bird Day, so I thought I would refresh my memory. Glad you found the information interesting. Thank you so much Carol :-)! Magnificent and I love the backstory of Draw a Bird Day. Thanks very much Catherine :-)! It is a sweet little story. Myriam, what a beautiful and amazing illustrated bird, I love all of the detail and gorgeous color. Nice touch with the background changes. Thanks so much for sharing your amazing talent with us. Thank you so much for your awesome compliments Sharon :-)! And thank you for inspiring me with your colourful bird art and funky Photoshop collages and effects. I’m glad I got some help from J with my background. I always seem to forget about my backgrounds :-D! Stunningly beautiful. The patience, talent and dedication really shine. Love the rendering in colored pencil and am in wonder at how you were able to translate the delicate feathers on the head and throat, the look of texture is so realistic I almost expect to see it fluff its feathers…a wonderful work of art. Thank you for sharing the different backgrounds, they are all great…outer space is awesome!…Three cheers for your husband’s support and addition of the backgrounds…makes a world of a difference in showcasing your excellent creation. Thanks for your wonderful words Haunani :-). Much appreciated. Outer space *is* awesome! I’m glad J had some fun ideas for my background. I always forget that backgrounds are cool art subjects too. And thank you for inspiring me to be patient when drawing – I appreciate the time you put into your exquisitely detailed pen and ink drawings and your multi-layered paintings. You are too kind, if only I had an ounce of your patience…sigh. Oh, no, I’m definitely not too kind :-D! And I’m sure you have at least an ounce of patience. And if you don’t need much patience to create your beautiful art, well, yay! Wow~super job with this bird! Isn’t it fun to see how the different backgrounds alter the appearance of colors? Thanks very much Melissa :-)! Yes, I did notice how backgrounds change the appearance of the foreground colours. I watched a YouTube video recently of an artist creating a colour pencil eagle and she said she always coloured her backgrounds first, so that she knew how light or dark to go with her foreground colours. 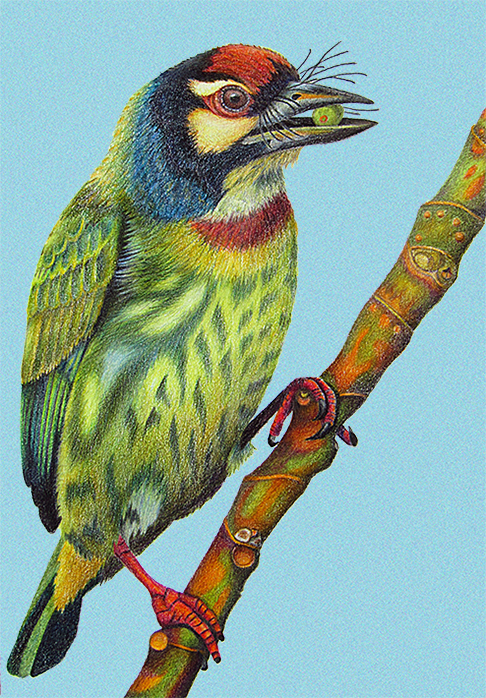 It was interesting to notice this effect so clearly when I viewed my little barbet on lighter and darker backgrounds. That is just beautiful! How are the Polychromos, do you like them? I’m thinking on getting a new set of colour pencils once my old Prismacolor ones are finished. Thanks Priscilla :-)! I like the Polychromos a lot. They feel a bit different from Prismacolor pencils and look a bit different and blend a bit differently because they are oil based instead of wax based. I recommend checking out Lachri Fine Arts to read the reviews on Polychromos vs. Prismacolor and Polychromos vs. Luminance http://lachri.com/?s=polychromos. Plus she has lots of great YouTube videos. Supposedly Prismacolor pencils went down in quality some time ago. That is just absolutely stunning Myriam – a masterpiece on all counts. I was sure it was a photograph! Thanks so much for the superb compliment Jacob :-)! Thanks M &J ….Great team work..Tthose vibrants colors ,color my day.Beautiful eyes Bird. Thank you so much Jeanne :-)!!! I’m glad you enjoyed the colours. So many bright colours popping out of the ground and tree branches right now! Really beautiful drawing. I vote for the one with mountain and jungle background. Thanks very much :-)! The jungle mountains do create a wonderful and believable atmosphere. Thank you so much for your encouraging words Jill :-)! And thank you for inspiring me with your joyful and imaginative art. Really! I still look at it sometimes and can’t do anything but gasp in admiration.